Fabulous layout Lisa! You were really a cutie at the age of 2!!! (still are :) ). What a fun tradition to put an extra candle on the cake. I can't remember if we had traditions like that, so I guess we didn't have them, otherwise I would have remembered. I always have a cake with candles for the kids when they have their bday. When we're going to cut it, we all stand around the bday kid and his/her cake and sing "happy bday" and then he/she can blow out the candles. Other than that we don't have any traditions :). So BEAUTIFUL!!! LOVING those photos of you, the colors and loving that background paper!!! What sweet photos and a darling page. I would have never thought to use the Scrabble paper for a background but you sure made it work. Your mom had fun bday traditions! We always have birthday pancakes, complete with a candle. But we don't open gifts until after dinner. It was always so hard to wait! Two photos for Two years old! Such a darling page. I like how you built all your embellishments around your birthday. I really, really, really love this layout. The photos are just so cute and I love how you journaled your mother's traditions. oh my golly - what adorable photos!!! totally love this layout and the vintage feel to everything-- you really rocked it!! How cute you are. Love the pix - they are precious. Love the page. So vintagy and love the papers - esp the background - you totally rock that. This is adorable! You have totally matched these photos perfectly! Love! Such a great layout Lisa! I really like the addition of the doily and ABC frame! So fun! I love that you are scrapping your old photos, these are going to be heirlooms! Beautiful job scrapbooking a "little" Lisa!!! darling!!! I love it love it love it!! so fun! how wonderful, I just love your collage style layouts. Such cute photos of you, Lisa!! 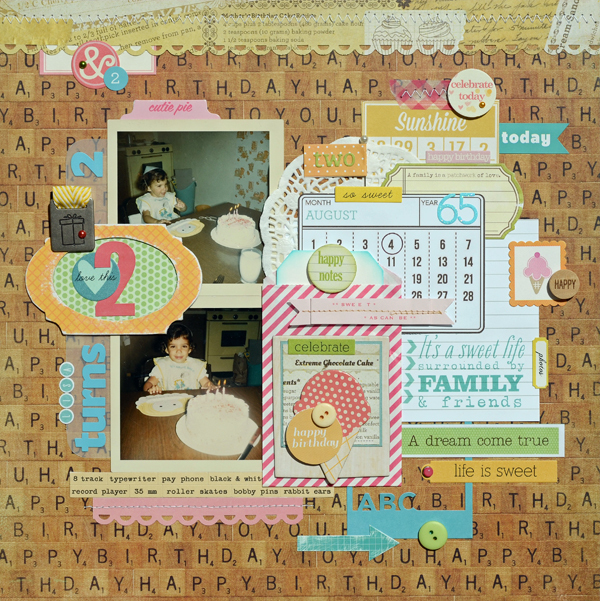 Love that "Scrabble" paper for your background and all of the layering is so pretty!! Really beautiful design! So stinkin' cute! Love it! Beautiful job!